OXFORD, Miss. — The Rebel bats came alive Friday night at Swayze Field as Ole Miss used 17 hits to score 12 runs, en route to a critical 12-4 SEC win over No. 16 Florida. The Rebels improve to 21-10 on the season and 6-4 in SEC play. 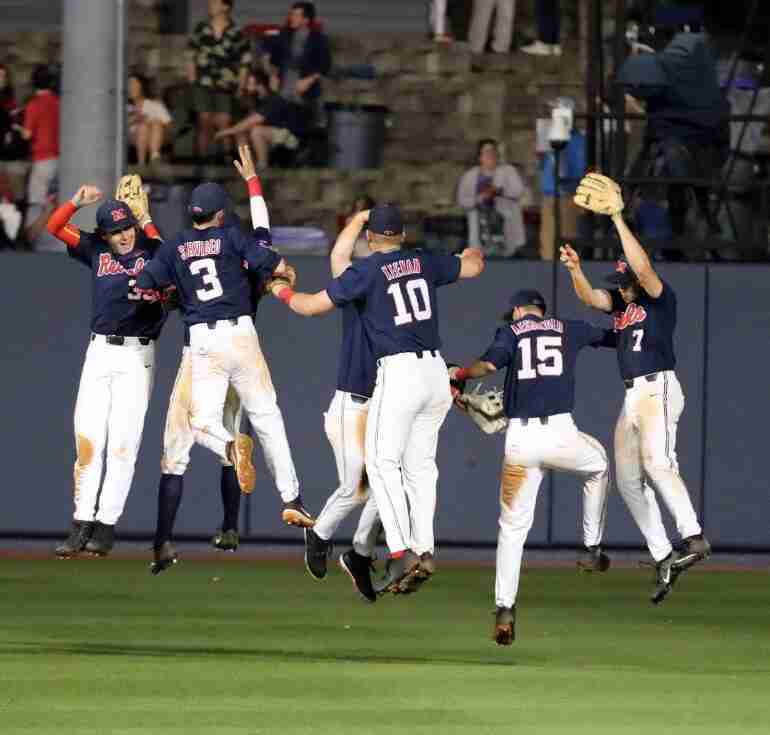 Seven Ole Miss players finished with multiple hits in the win. Third baseman Tyler Keenan went 3-for-5 with three RBI–including his ninth homer of the season that ties him with Thomas Dillard for the team lead. Catcher Cooper Johnson tallied a career-high 5 RBI, including a three-run home run in the eighth inning. Starter Will Ethridge took the mound for the Rebels and only needed 18 pitches to get out of the first two innings. He notched two quick outs in the third, but had to leave the game after re-aggravating a blister on his throwing hand. In typical “next man up” fashion, in came Tyler Myers who threw 5.1 innings in relief and earned the win for the Rebels, moving his record to 2-0 this season. After Florida took a 2-0 lead in the top of the third inning, Ole Miss responded with a barrage of hits. The Rebels hit back-to-back homers in the bottom half of the inning to take a 3-2 lead that they never relinquished. Tyler Keenan pounded a two-RBI home run that tied the game, and two batters later Cole Zabowski plate hit a monster into the left field bullpen. Myers and the Rebs held the Gators scoreless in the top half of the fourth. In the bottom of the frame, Ole Miss scored four additional runs to take a 7-2 lead. Keenan singled to right center, scoring Ryan Olenek. Grae Kessinger, who had singled through the left side, scored on a passed ball. Then, Johnson’s single to left scored Dillard and Keenan. In the fifth inning, Florida hit two solo home runs to cut the Rebels’ lead to 7-4, but that would be all the Gators would score for the remainder of the game. In the bottom of the seventh, Ole Miss increased its lead when pinch-runner Josh Hall scored on a wild pitch. Olenek added a sac fly that scored Anthony Servideo and pushed the lead to 9-4. Then, Johnson capped off the hit parade in the bottom of the eighth with a huge three-run homer to left field, giving him five RBI. Due to inclement weather in the forecast for Sunday, Ole Miss and Florida will finish up their series with a doubleheader Saturday starting at noon. Game 3 will take place one hour after the conclusion of Game 2. Ole Miss improved to 21-10 on the season and 6-4 in SEC play. Head coach Mike Bianco logged his 300th win in SEC play. Ole Miss’ 17 hits came as its most in SEC play this season. The Rebels reached double figures in the run column for the 12th time this season. They also have 15 games with double-digit hits. Ole Miss has scored three or more runs in an inning 35 times this season, including three today. Cooper Johnson drove in a career-high five runs, including his sixth career home run and fourth of the season. Tyler Keenan upped his SEC-leading RBI total to 47. He also hit his ninth homer of the year, tying him with Thomas Dillard for the team lead. Tyler Myers had a streak of 10.2 scoreless innings snapped. He has now gone the last 15.1 innings with just two runs allowed. Every Rebel starter had a hit and seven scored runs. Seven Rebels had multi-hit days.